Neolo Review 2019: Is Neolo a Good Hosting? Neolo provides a wide range of hosting and server solutions for all budgets and needs. As well, Neolo gives you the opportunity to work with your favorite website manager, from WordPress to Magento. Neolo was founded in 2002 by a teenager in his parents’ basement in Buenos Aires to provide reseller hosting. Today, Neolo serves users from all over the world and provides all types of hosting including VPS and dedicated servers. Their website offers fantastic language support for just about any language as well as serving a global client base. Great Content Management System (CMS) support: Whether you prefer working with WordPress, Drupal, Magento, or Joomla, there’s a good chance Neolo supports your CMS. 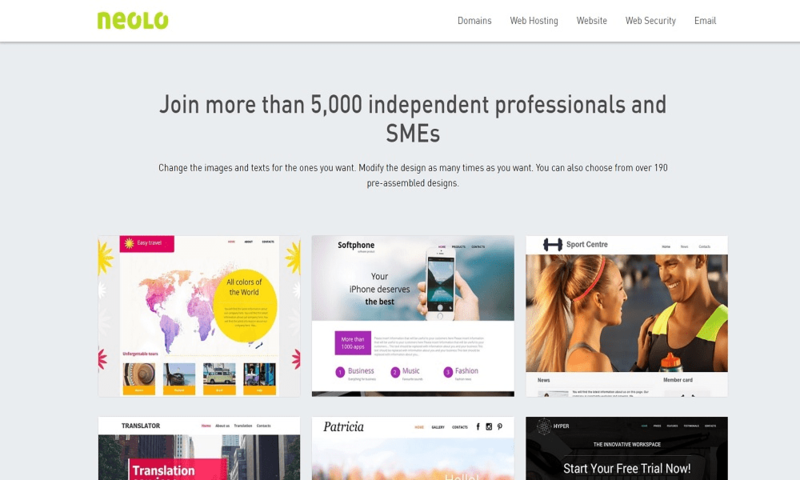 Website builder: Neolo provides an in-house website creator tool complete with a library of templates to build your site. Website optimization: They provide a website optimization service (for a fee) to help your site perform better on search engines and improve loading times. Softaculous: Choose from over 200+ apps to install with one click. The biggest reason why Neolo is easy to use is due to their great support staff who will help you all the way when setting up your site. Because they provide access to almost all major CMSs, you can also manage your website in a way that you find most comfortable. The same goes for their hosting manager consoles as both cPanel and WHM can be used. All of these plans come with 1 website and free SSL. WordPress is the exception with its very own pricing structure. The first free premium plans are almost identical. However, there is also an “Unlimited” plan with unlimited websites, storage, and SQL databases as well as a “Plan 1” with only one domain at a very low price. There is also a managed WordPress hosting option for a hands-off approach. For customers with greater demands, there are also options for colocation, VPS, and dedicated servers as well as a number of premium hosting and reseller hosting plans. Most Neolo plans are simple in that they are almost only tiered according to physical resources and don’t put a limit on bandwidth or traffic. The only thing to complain about from a support perspective is that they only offer one phone line for support. However, they do provide a ticketing and live chat support system. I found that they were especially helpful when setting up my hosting product and staying with me every step of the way until it was completed. onClick="trackClickout('event', 'clickout', 'Vendor Page - Visit User Reviews', 'Neolo', this, true);"
If you have a slightly higher than average budget and want a no-fuss hosting solution with generous terms Neolo should have a solution for you. If you have struggled to find a provider in your language, they also offer the best chance of satisfying your needs. Wondering how Neolo stacks up against other Web Hosting companies? Enter any other Web Hosting company and we will give you a side-by-side comparison.